An active CPA must earn a minimum of 80 qualifying hours of continuing education each license period to be eligible to renew the license. A licensee can complete continuing education in technical and non-technical subject. 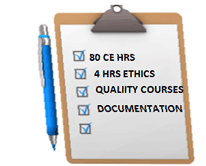 Four hours of CE in professional ethics always required to be must be completed in each two-year period. Licensees report continuing education hours earned at the time of license renewal. The license renewal application prompts the licensee to indicate the number of continuing education the licensee has earned since the previous renewal application date. “Licensees may only report credit hours earned up to the date the renewal application is filed.” A licensee may not report any CE hours that are expected to be completed after the date the renewal application is filed. Any credit hours a licensee earns after the date the renewal application is filed can only be reported at the time of the subsequent license renewal. Individuals who file license reinstatement applications may only report continuing education hours earned within two years of date of filing the application. Note: License expiration dates are fixed and are not subject to change. Continuing education credit hours reported to reinstate a license cannot be applied to the 80 hours required to subsequently renew the license. Licensees may amend the continuing education hours reported within thirty days of the date an application is filed. The request must be made in writing. Documentation to support the original credit hours reported and any additional hours must be submitted with the request. Up to 80 CE hours in addition to the first 80 hours that a licensee reports are eligible to be credited for use the next time the licensee renews the license. Continuing education hours in ethics, in excess of the required four hours each license period, can be used as ordinary CE. Four hours of ethics CE must be earned in the license period immediately preceding the next renewal term. Continuing education hours that are reported are subject to audit by the Board. Licensees chosen for audit are required to submit an audit inventory sheet and documentation to support the number of credit hours reported in an application. Continuing education courses earned through sponsors who belong to the NASBA CPE Registry need only to submit the course completion certification that is issued by the sponsor. Download the Audit Inventory Sheet (Excel). Licensees are required to retain documentation supporting the continuing education credits they have earned for four years.